Dedicated to offering clients superior services, Weaver and Sons fabrication shop possesses a staff of AWS D1.1, D1.2, and D1.3 certified welders who can perform expert MIG, TIG, stick, flux core, aluminum, and spot welding operations. In addition, we have the technology and capacity to perform robotic welding with an 8′ reach. Our expert welders can work with a wide variety of metals, from stainless steel to cast iron. Our welding operations meet the needs of diverse industries, ranging from machine shops to foundries to industrial equipment manufacturers. We manufacture components and assemblies for OEMs around the country – from prototypes to full production volumes. 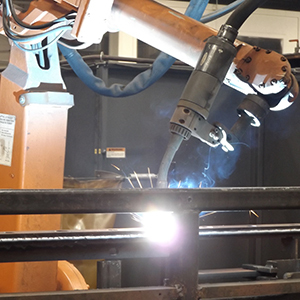 Additionally, we offer robotic welding capabilities for repeating, higher volume work. We also provide custom fabrication services for industrial, commercial and construction applications throughout the Southeast. For more information about our premium welding capabilities, or any of our other advanced machining services, please contact Weaver and Sons today.